In late Autumn, 2010, Shuping and I decided to take some time off and go exploring for a weekend in the Coromandel Peninsula. On a brilliant sunny day we drove up the winding, cliff-hugging road to Port Jackson and called into the DOC campsite to have a look around. Of course, Port Jackson is no longer a port - the days when the early pioneers logged the Coromandel hills and dug for gold have long gone. Today, Port Jackson is a stunningly beautiful bay, sheltered from the wind, and about as far away for the mad rush of the city we had just come from as you can imagine. On the camp noticeboard was a picture of one of the visitors proudly showing off a huge snapper. The campground was pretty quiet and we went for a walk along the beach and past a couple of motorhomes, one of which had a large windmill mounted on the top. The owner was up there making some adjustments, so we stopped for a chat. He described how, 8 years earlier, he and his wife had decided to try motorhoming for a couple of years to see if they liked it. They've been pretty much full time on the road ever since - enjoying the best that New Zealand has to offer all year round. We left them there, leaving me to calm my wife down as she was gettng all excited about doing the same. I was much less impressed, imagining all the constraints of living in a confined space, without all the home comforts that we mostly take for granted - minor things like having plenty of hot water and power, internet access, and not having to make frequent visits to a dump site. However, the discussion continued and we decided to attend the next motorhome expo in Hamilton. 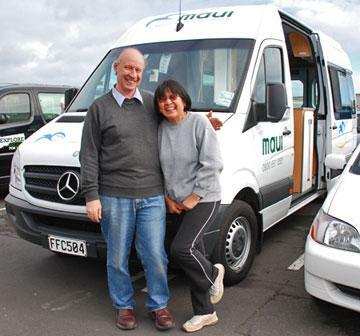 We had a long chat with some friends who had bought a caravan and spent a couple of years touring around New Zealand. By this time it was early Autumn of the following year and we decided to take advantage of a half-price special for renting a motorhome for a weekend. I figured that this would be the best way to find out first hand all the limitations of the motorhome lifestyle. What a fantastic weekend we had! From Auckland we drove up to Tutukaka where we stayed at a commercial campground for the first night. From there we drove up to Otamure Bay, stopping to explore some delightful beach walks along the way. The motorhome quickly became our home, and the convenience of being able to stop and explore, or have a cuppa or a meal, was just magic. The DOC campsite at Otamure Bay was spacious, clean, and stunningly beautiful. We went to every motorhome show in Auckland and Hamilton over the next couple of years, firming up what features we needed. We also discovered that it was possible to buy a motorhome in the UK and tour Europe before shipping it back to New Zealand. While there are some size limitations, the opportunity to also tour around Europe was a very attractive option for us. We joined the NZMCA and started reading their magazine from cover to cover - taking note of all the letters from members, as well as all the feature articles. It was during this time that the idea for building this website was born. While researching the places we might like to visit, I found that there was very little information online for people exploring New Zealand in a motorhome or caravan. The NZMCA provides an excellent directory, and do a great job of providing a wide range of member services. But, with over 2,000 locations in their directory, they can hardly provide more than a basic summary of the facilities available and basic contact details. So, our goal for this website is to visit as many of these locations as we can, taking pictures, and describing what we find. While we hope others might find this interesting and useful, and even make their own contribututions, it is mostly about having fun exploring our beautiful country and sharing that with anyone else who might be interested.